Face-lifted Mercedes B-Class on sale now | What Car? The Mercedes B-Class has undergone a face-lift, with the new version available to order from today. Changes for the new model include a choice of more efficient four-cylinder engines, and, for the first time for Mercedes, a fully electric option, which has been developed with assistance from electric vehicle manufacturer Tesla. Four diesel versions are on offer, starting with a 108bhp 1.5-litre unit, which is available as the B180 CDI or B180 CDI ECO. This latter variant offers greater efficiency whilst maintaining the same performance, and averages up to a claimed 78.5mpg with CO2 emissions of 94g/km. A 2.2-litre diesel with either 134bhp or 175bhp is used in the B200 CDI and B220 CDI respectively. For those that prefer petrol power, a 1.6-litre engine is offered in both the B180 with 120bhp or the B200 with 154bhp. Drive is transmitted through either a standard six-speed manual gearbox, or optional seven-speed dual-clutch automatic; owners can also opt for four-wheel drive on selected models. The electric version, which Mercedes hope will compete with the BMW i3 and new Volkswagen eGolf, is claimed to have a range of around 120 miles and a 0-60mph of 7.9seconds. Styling changes for the new model include new front and rear bumpers and two-slat front grille, plus daytime running lights incorporated into the headlights. On petrol and diesel versions owners can now opt for full LED headlights, which offer better nighttime vision. The cabin, which Mercedes claim has a more premium feel than before, gets a new free-standing eight-inch screen – similar to the new C-Class’s – plus new instrumentation and the option of 12 different ambient lighting themes. It also has the bullseye style air vents that feature in the likes of the A-Class and the new C-Class, as well as high-quality feeling plastics. A number of new convenience and safety features are on offer, too. A collision prevention system reduces the risk of rear-end shunt and there is a standard Attention Assist feature that monitors the driver’s attention level and grades it out of five. The Mercedes 'connect me' service is also standard, which allows owners to connect remotely to the car via a smartphone. They can then check on how much fuel is in the tank, or the remaining battery charge on the electric version, as well as preselect the interior temperature. 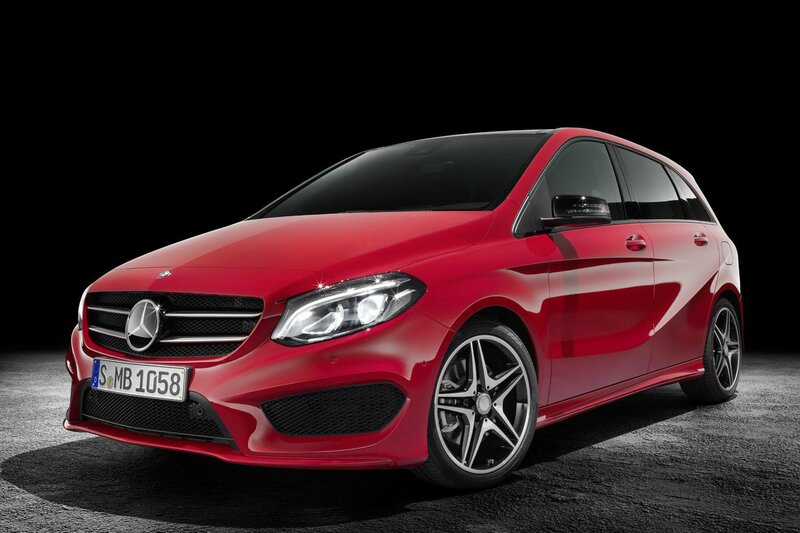 The first UK deliveries of the new B-Class are expected to begin in November 2014. Prices will start at £22,575 for a B180 with a manual ‘box, but we expect that there will be deals available. Previously, it was possible to negotiate between £1500 and £2000 off the price of the old B-Class.